St. Patrick’s Day started with a nap. I got home from work that morning and decided to rest for a couple of hours before heading to the race. I was asleep in about 0.7 seconds. Around 10:30 we set out for the Kids Fun Run. We live about a mile from where the festivities were taking place, but we live in the next town over. You have to cross a bridge to get there. We might as well have just walked because cars were parking along the bridge. My husband maneuvered our car into the weirdest spot on a traffic island in front of a yield sign. He didn’t seem to think there was any problem with his creative parking spot. There were tons of people out. We found the starting ares for the kids races. It was packed. They had it divided into age groups but there was no way we could get Carlos into the 5-6 year old section because of the crowd so we snuck him into the 4 and under. He ended up running with a friend from school. The other mom and I ran along behind them. They were so cute and held hands the entire time. The spectators for the kids races are more than I have seen at some of my races. It was awesome. At the end the kids get a package of cookies and a T-shirt. The shirt has a #1 on it so Carlos told everyone he came in first!! My husband had left us to find my mom and my aunt. They waited at the finish line. Then we walked around a bit before the Mummer’s Parade. Somewhere along the way my mom bought a bag of green popcorn. Everyone loved it. I didn’t try any because I am a bit superstitious about eating anything other than my usual peanut butter and banana toast. It did look good though. I ran into quite a few people I knew. I realized something interesting. I am not that miserable self-conscious person I once was who would clam up in social situations and act as though I didn’t want to be there. I was smiling, laughing and enjoying the day. I still get self-conscious about my body, but not like I used to. I was wearing fitted capri running pants and a green t-shirt which accentuated my curves quite nicely as my husband commented when I put it on and over that a fleece sweatshirt because it was cool out. Though I thought to myself when I got dressed, “I wish my legs were smaller,” I didn’t think about it once I was at the race. Crazy things our minds do! Sometimes what I really wish is to just shut off my brain. At about 12:40 I ditched the sweatshirt, pinned on my bib and gave hugs before heading to the 10K starting area. I walked and walked past the pace groups, you couldn’t get in because there were gates in place and people were already packed in like sardines. I walked some more, kept walking and finally squeezed myself in near the back of the line. People were commenting on how great the turn out was for this year’s race. I’m sure the weather report helped. Although it was still overcast and in the low 60s when the race started it was perfect running weather. The sun made it’s appearance as the last runners crossed the finish line. I chit chatted with runners around me. Every runner has a story and conversations at races inevitably lead to the story. The woman next me told me that she started running after losing her husband to a heart attack a number of years ago. She looked to be in her 50s. She has run the Burlington, VT marathon and a number of other races. She said that running a marathon was one of the best experiences of her life because it made her realize how much she was capable of. Before I knew it the crowd started moving. We said good luck and off we went; sort of. We were moving at a fast walk at best. As soon as I could I picked up the pace. There was a sea of runners in front of me. The spectators along both sides of the road were incredible. They were cheering, waving, blowing horns and ringing cow bells. The excitement was infectious. As usual I had a huge smile on my face. The course starts out fairly flat but around mile 1 the first of three major hills begins. I don’t know if it was the crowd of spectators or the adrenaline of the race, but for some reason the hill didn’t seem so bad this time. I have run most of the course a few times before and the hills were difficult. I felt really good. My pace was as consistent as it could be with so many runners. I tend to hang to the right hand side during races. I had to run on the sidewalk quite a few times because there was virtually no room to move. My heels and toes got stepped on and I’m sure I clipped a few too. The second big hill was tough but again not as tough as I remember it. The miles seemed to go by quickly, but I didn’t feel as though I was running very fast due to the congestion of runners. I don’t wear my Garmin when I race so I had no idea how I was doing on time. The time clocks along the way didn’t help because I started so far behind the starting line. The third hill is more of a steady incline. It is along a residential street which has a community college located on it. The spectators never seemed to let up. They were at every point of the race so far. It was such a motivation to keep going. At this point I was also motivated by the impending down hill stretch I would soon encounter. I was ready to fly. I let gravity take charge and down I went. At around mile 4.5 I passed the hospital I work at and I was kind of disappointed not to see many spectators there. The hospital actually sponsored a 5K walk as part of the road race this year. They didn’t even have a water station. Maybe I’ll have to talk to someone about that!! It was at the hospital where the walkers merged in with the runners. The walkers were supposed to stay to the right, but things got a little crazy with that in my opinion. After an upward climb thus far we finally got to coast downhill and you had to negotiate people walking with strollers and dogs and also people meandering right into the runners paths. We encountered another upward slope but then the course flattened out until just at the end where the last quarter of a mile was a slow incline to the finish line. That was cruel! The spectators were wild at the end especially in front of Griffin’s Tavern. Let’s face it many were well on their way to a very Happy St. Patrick’s Day! There were a few spectators handing out beer to runners as we neared the finish line. I picked up my pace and gunned it to the finish. The time clock read 1:07:47. Hmmm I thought not bad considering the hills and the amount of runners on the course. I knew my chip time would be a bit less so I was pleased. I hoped it would somewhere in between my two previous 10K times of 1:07:36 and 1:04:16. My family is so supportive about my running. My husband and my son are at every race and my mom has been to a few including the marathon, my aunt and my sister have also come to races before. They are tremendous supports, but they haven’t gotten the hang of actually finding me on the course. Yet another race bites the dust where no one in my family saw me run. It doesn’t upset me. I actually think it’s funny. I think they need training on how to find a runner at races. They were really disappointed, but had a good time nonetheless. We hung out in the park for a bit chatting with friends. It was probably the most fun race I have run. I would definitely do it again next year. I was a little bummed that I had to get back home sooner rather than later to go to bed before work again that night, but we had a great family day. Much to my surprise shortly after arriving home I got a text from Racewire announcing my official race results. Are you ready for this 1:01:35!!!!! I drifted off to sleep wondering if it was just the luck of the Irish or if I really ran that time. Maybe it was a little of both. Hi Aimee! Very very good! I always look up the exact mileage that 10 k is and roughly figure out your miles per hour. So you ran it all at about 6.1 miles per hour, which I think is quite fast. I’d never last too long at that speed, maybe 20 minutes at best. It’s great that you have Carlos running too. That’s so cute how he ran hand-in-hand with a friend. The picture above shows how much he looks like you. Did you notice that in the picture? Overall, that sounds like such a fun time. Our family needs to get away from the bustle of our lives like that too. Marion, I was so pleased with my time. It proved that my efforts really do pay off. I felt really strong throughout the race even with the hills. It’s funny that you mention how Carlos looks like me. A lot of people say that, but I have a hard time seeing it. He does share some of my features and even more so my sister’s. He makes facial expressions that are exactly like his Auntie’s especially the mischievous faces! Aimee…sounds like you had a great run! And your family looks so good in that picture…you really need to take more pictures of yourself…you look AWESOME!!!! A STRONG, HEALTHY person 🙂 Congrats on the new PR!!!! Hi Kaye! I’ve really been slacking in the photo department lately. Thank you for the compliment. For the first time in a long time I didn’t say anything nasty about my picture. I don’t save my race bibs so I think of the photos as a memento of each race. 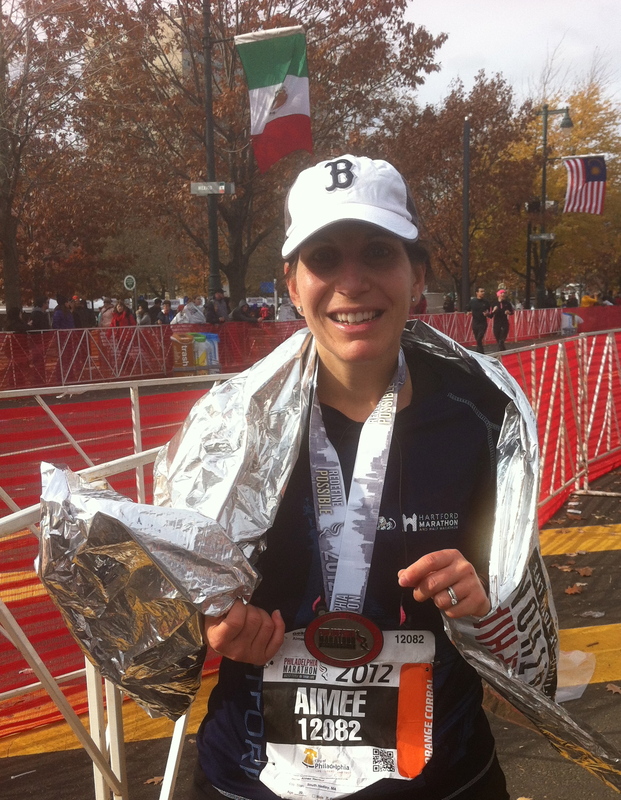 Awesome run, Aimee! It sounds like you had a great time, and I love that picture of your family, so cute 🙂 I giggled at Carlos saying he came in first place, he is such a cutie. You look FABULOUS by the way! I remember the first time I watched my sister run a marathon – we didn’t catch up with her until mile 17! AWESOME time! And I love that Carlos thought he came in first place – I would never let him know otherwise! Loved reading this post Aimee! If it weren’t for my friend when I ran Disney I’m certain no one would have seen me finish. She knew exactly where to go and directed everyone. I have a really bad habit of telling everyone it’s going to take me longer than it really does so sometimes I’m to blame. I know it can be tricky to navigate the races as a spectator so I really don’t get worked up over it. I’m glad you finally found your sister. Did she run Chicago? Sounds like an awesome day all around. Great run!! Makes me bummed I am not running the Shamrock Shuffle here. It was a fun day Jacky. 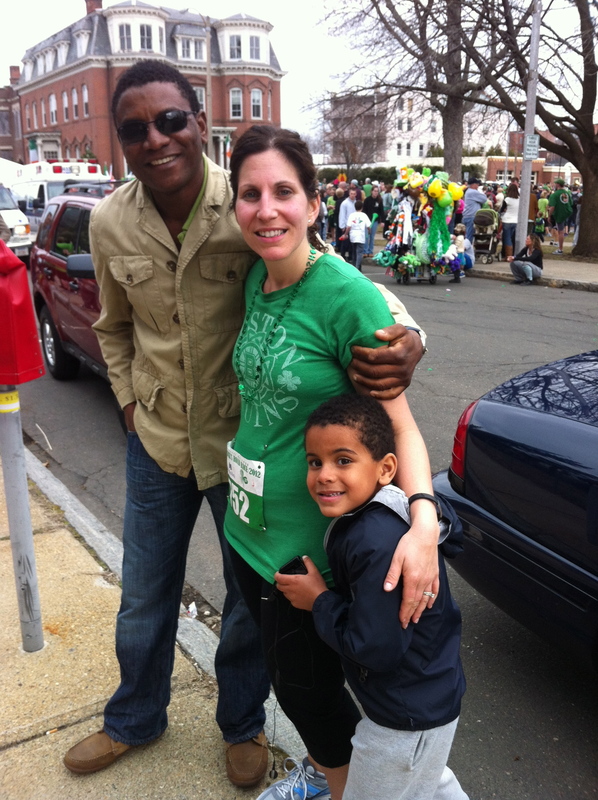 I read on your blog today that you did your own Shamrock Shuffle. Congratulations on your time!